work 4tr into next space, yrh draw through all 5 loops. * rpt from * to * to last 2, 1ch spaces, 3htr into each of the last 2, 1ch spaces, ss to top of 2ch. Turn. Round 4 - 1ch, 1dc into base of 1ch, 1dc into each st, working (1dc, 2ch, 1dc) into all 2ch spaces on corners, ss to first dc on beginning of round. Fasten off. make several and join together to make placemats, blankets etc. 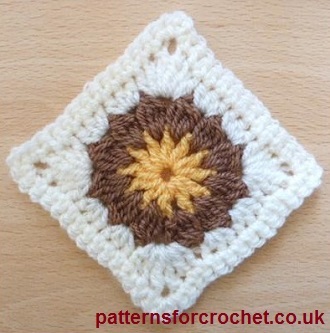 Hope you enjoy this free crochet square motif.